For an all-white wedding choose a simple three tiered cake in a vanilla and raspberry sponge, and then cover it completely in white chocolate roses. Pure white weddings are once again becoming popular, but without another colour in your wedding cake design you will need to add texture in order to create interest. If you have chosen a classic traditional theme, a multiple tiered white cake decorated with flowers and supported by a structured stand, would be what you are looking for. Add a modern element in the shape of fondant roses stacked between the tiers to hide the cake stand pillars. Keeping in line with the seaside theme, have your cake iced in pale blue and then decorated with white icing star fish and shell designs. Alternatively, red and white striped icing can give a cheeky deck chair appearance. Light sponge flavours such as lemon or carrot are most appropriate for a seaside wedding. 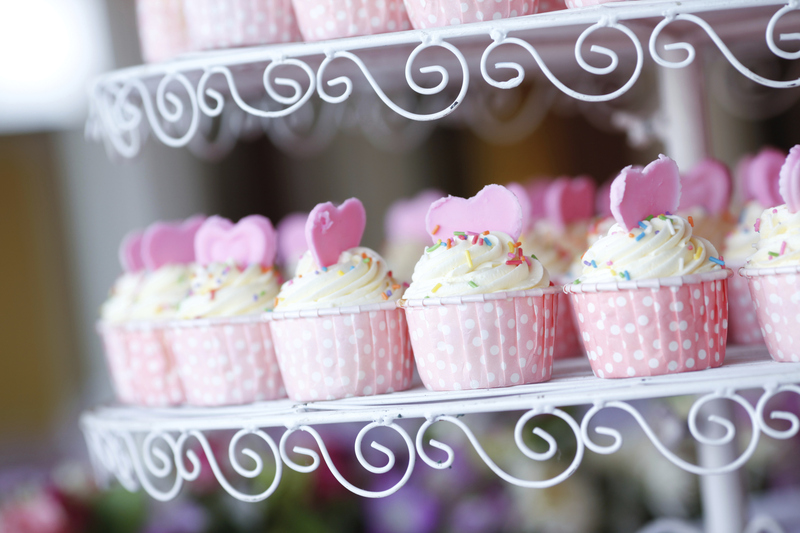 The latest fashion of having a miniature cake tower would be the perfect choice for a modern wedding. This is an updated version of the cupcake tower and consists of a regular cake which acts as the top tier for the bride and groom to cut, and then mini versions of that cake which are piled up to create the lower tiers. Plain white cakes can be dressed up with gold ribbon, antique jewellery, and deep red or pink flowers for a subtle vintage effect. There are lots of other ways to create a vintage cake look; one contemporary option would be to have a two or three tiered fruit cake with duck egg blue icing and then have white lace effect icing or monograms over the top. You may have had a difficult time finding black flowers for your wedding, but for your cake you can easily add black fabric or fondant flowers. Have contrasting black and white patterns on each of the tiers, including stripes, diamonds and checks. Monochrome weddings are always popular, and a black and white cake can look very effective. A chocolate mud cake would work well for an outdoor garden reception if it’s not going to be placed directly in the sun for too long. The cake itself could be iced in rich greens and earthy browns, and could be decorated with brightly coloured flowers and butterflies. 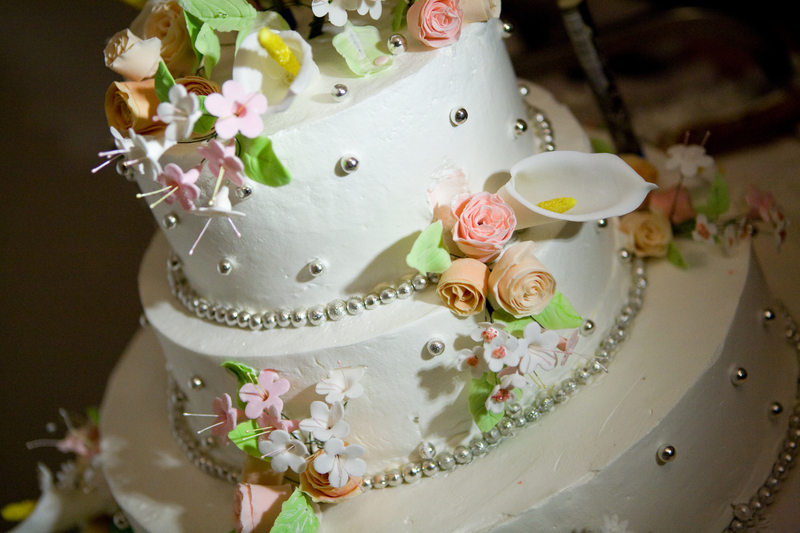 Take a look at your venue and borrow inspiration from the garden for your wedding cake. You could really push the boat out and have your cake made in the shape of a fairy-tale castle. Alternatively have your cake iced in pale purple, green, or another colour to match your scheme, with swirling patterns in silver or while. Add toppers in the shape of your favourite fairy-tale characters, or have fairies perched on the edge of the cake. For a fifties wedding choose a bold icing colour such as red to blend in with your colour scheme, and decorate with big white polka dots. For a seventies wedding you’ll want large stylised flowers in brown and pink. Every decade has its own style elements, and these can be incorporated into your cake design. You could have a two tiered cake with the top layer iced in sandy yellow, and toppers displaying the bride and groom relaxing in a hammock underneath a palm tree. Alternatively you could make good use of the trend for different shaped layers for a destination wedding cake, as the tiers could be made to look like suitcases stacked on top of each other.